Driving Tuition is a highly competitive industry. With over 40,000 approved driving instructors in the United Kingdom, there is certainly no lack of choice anywhere in the country for students to choose from. This fierce competition also extends online with many tens of thousands of websites, social media profiles and advertisements spanning across the internet all trying to get you to pick them as your instructor of choice. 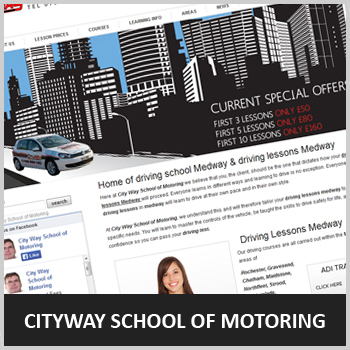 Simply having a website is not enough nowadays, especially for driving schools. There are many aspects of your website that need to be included to entice potential students into going with you. A good starting point is to have a modern and easy-to-use website. Here is a list of tips to help you improve your website in general such as call to action, responsiveness, and social media. As a driving school, however, you need to take your website one step further. Your website needs to be tailored specifically to target those who are looking to take up driving lessons, and your website should contain all the features and information necessary for potential new students to browse through. 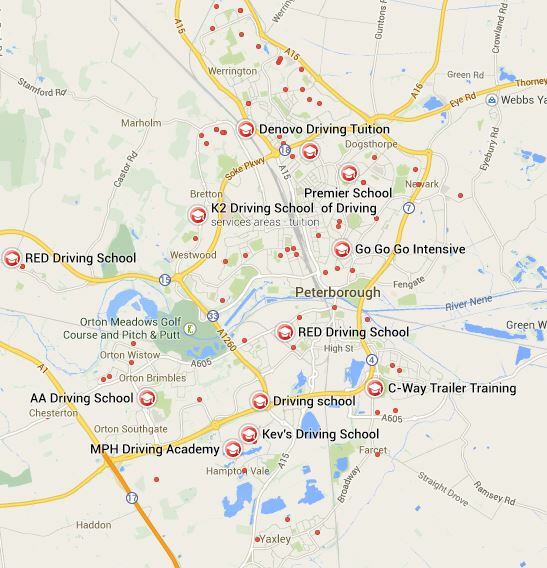 Each red dot represents a driving school – see how many there are in Peterborough alone! One of the most important things visitors to your driving school website will want to do is compare your prices against other driving schools. We recommend that you outline exactly how the cost is broken down across all the options that you offer, to help the viewer decide what is the most appropriate for them – for example lessons by the hour or as an intensive course. Driver training is a very personal experience; no matter how qualified an instructor may be, there are some people that will not be compatible with their style of teaching. Give as much detail about yourself as possible, including qualifications, how long you have been teaching for and why you became an instructor. If your prices are not the cheapest, explain why. You can also give some more personal information if you like. While this is an important part of any driving school websites, providing contact information is absolutely vital in your case. As mentioned earlier, driving lessons can be very personal. Allowing interested people to directly and easily contact you to discuss their requirements will certainly help you to generate more business. If someone can’t get hold of you it’s very easy for them to go to your competition instead! It is also a good idea to implement an easy-to-use online booking form on your website, as some people do not like the hassle of directly contacting or phoning someone else up. A good booking form will allow people to book and pay for lessons with you online, in their own time. Testimonials are proof of the quality and reliability of the services that you offer and are a good persuader for those on the fence. Your website needs to contain up-to-date, accurate and verifiable testimonials. You can integrate them from review websites such as Freeindex or via social media. You could even upload video testimonials! With the many different types of training that driving school websites can offer, from hourly lessons to intensive courses, and motorway training to pass plus, it can be overwhelming and confusing for potential students to know what the best course is for them. Your website should contain an easy to read list of all types of courses that you offer with detailed information about each, as well as who the course is aimed at. People who are thinking about leaning to drive are likely to also be seeking information about driving as a whole, and what learning to drive entails. A good way to keep people on your website is to provide extra information about driving, such as information about the theory/practical tests including mock tests that people can take. Consider having some of the information in easier to digest formats such as YouTube videos.